Learn the basics of using the pottery wheel. 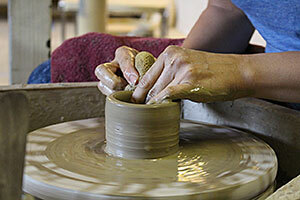 Pottery made during this workshop will be available for pick up 10 days after your workshop date. Pottery left for more than three weeks will be discarded. No age limit. Kids welcome and are half price. The participant must be 17 or under and a student in order to use the kids price. If you register an adult as a minor, you will be banned from any future classes and we will not refund your money because we feel you have tried to cheat us.